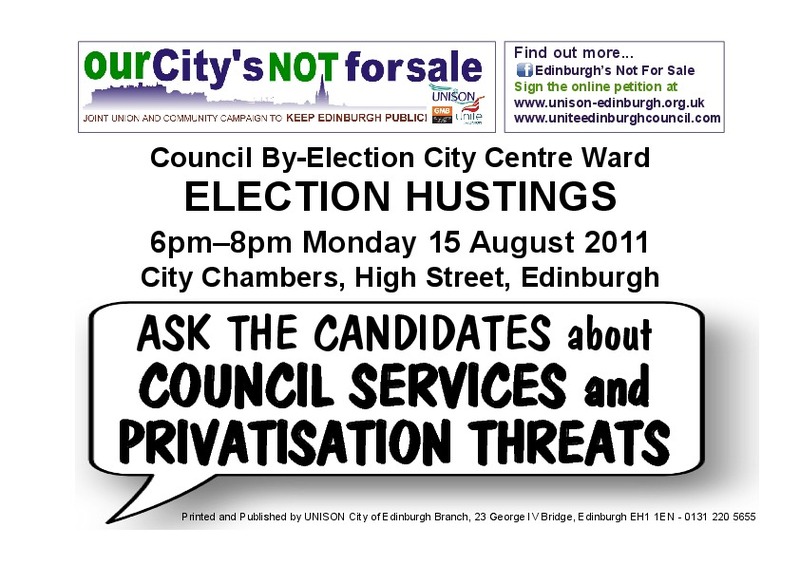 The public attending a lively hustings for candidates in the Edinburgh Central Ward by election to be held on Thursday 18 August, made it clear to candidates from all parties that they were demanding full consultation before any decisions on privatising Edinburgh’s services. As with previous public meetings, there was anger at the scale of the Council administration’s plans and the fact that few people had known anything about them. Lib Dem Charles Dundas and the SNP’s Alasdair Rankine insisted no final decisions had been made but UNISON’s Kevin Duguid was unconvinced. While both said there would be consultation before a final decision, Kevin was unable to get them to commit to voting against the plans if the consultation didn’t happen. Melanie Main for the Green Party also called for a halt to the plans. Independent John Carson drew parallels with the trams, claiming the council could not be trusted to be competent with big contracts. Conservative Ian McGill, while backing privatisation in gereral, also said there had not been adequate consultation. Ricky Henderson was standing in for Labour candidate Karen Doran who had broken her ankle while out campaigning and Charles Dundas was standing in for the Lib Dem candidate Alistair Hodgson. UNISON Branch President John Stevenson outlined the union’s concerns at the start of the meeting in the City Chambers. “The joint unions have called this hustings as Edinburgh is on the verge of the biggest privatisation of council services ever seen in Scotland”, he said. “The council is about to vote on a £1 billion privatisation that will affect almost every one of our services and up to 4,000 jobs in Edinburgh. In what they call Alternative Business Models (ABM), private companies will run everything from street cleaning to housing benefit. Your city is, indeed, up for sale. “These are huge contracts. One covers infrastructure, such as janitors, cleaning and facilities management. Another is for corporate services, including human resources and finance functions, for all departments. The third covers environmental health, including bin collection. “While we hear much about the trams issue, these plans will dwarf the trams and have the potential to be far more costly to the people of Edinburgh. “Now, the politicians here will shortly be telling you what their views are, so I ask you to indulge the unions for a moment in saying what we believe. “We believe the history of privatisation tells us all we need to know – poor quality services, dirty schools and hospitals, neglect of the elderly, hospital infections, job losses, cuts to pay, conditions, safety and pensions to name but a few. “We believe your taxes should be spent on services pure and simple, not on profits or dividends to shareholders. “There is an obvious question: If councils provide services without having to make a profit or pay shareholders, how can somebody provide the same service, at the same quality, and make a profit on top? “‘Efficiency’ is the answer we’re told. Apart from the obvious question, ‘have you ever phoned a company like BT and been astonished by their efficiency?’ we believe it is a smokescreen for destroying valuable jobs and cutting conditions, while lavishing money on directors and shareholders. “Councillors were sold on privatisation by consultants with fantastic talks of efficiencies in English “benchmark” councils – none, by the way, anything like Edinburgh. But many “benchmarks” savings were projections rather than hard cash. There was no hard evidence. The council claim privatisation will save money but the business case is not available for the public to see. No disrespect, but if you are like me, you like to see these things for yourself – or you get to wondering! “And as for private contractors carrying the risk, well after what we’ve seen of PFI, nobody believes that nowadays. These companies get a golden goose and become too big to challenge or too big to fail. The tail wags the dog. “But what if they do fail? What if they fail like Connaught – one of the early bidders which actually passed the Council’s financial tests just before it went bust – or like Southern Cross, leaving thousands of vulnerable people in limbo? “If the companies profit, they line their pockets with our taxes. But if they fail, we, the taxpayers, will have to pick up the tab. Now that’s something there is actual hard evidence for. “We believe that public services should be under local democratic control. You should be able to have your say on your services by contacting your councillor. No point if privatisation goes through, there won’t be much they can do. They no longer run the services, they just hand out contracts. “If we need to change the way services work at the moment, it is just a matter of the council making the decision. Under privatisation it could mean months of delay and loads of our money being paid out while lawyers argue about what is actually in the contracts and what isn’t. “So, you will hardly recognise many council services after privatisation yet there has been no public consultation on these unprecedented plans. It is also worth remembering that not one of the political parties mentioned wholesale privatisation in their manifestos when they were standing for election. “And there are many other worrying parts of this process. At the beginning of the process, the council rejected expert advice to include equality, human rights and environmental obligations in the formal contract advert. They didn’t want to “deter market interest”. “The council has not engaged disabled people about access to the new services as required by law. There has been no assessment of sustainability issues to ensure that the private companies protect the environment and develop “greener” ways to deliver services and reduce carbon emissions. “And it gets worse. The final shortlist includes two companies connected to multi-million pound fines for price-rigging in public service contracts. Two companies were allowed to take part in the privatisation process despite the fact the council caught them withholding information about convictions arising from fatal workplace accidents. One company was caught, reprimanded and caught again within the space of a few months. And still they were allowed to stay in the bidding process. “All very worrying. All in a process that seems to be hurtling ahead on roller skates. “But there is an alternative. “Each of Edinburgh’s privatisation projects is being shadowed by in-house options. Unlike the secret private bids, the in-house bids are open and transparent and deliver real savings. We believe they are streets ahead on price, quality and risk management. “It’s worth remembering that Edinburgh’s services have won at least 10 awards in the last year. “The unions are saying it is time for the Council to abandon this wasteful adventure and get back to focussing on delivering efficient services with its own staff. But whether you agree with the unions or not on privatisation, you surely have the right to be consulted on such a massive change that will affect everybody. ” Surely no decisions should be made until the people of Edinburgh have had their say. And until they’ve had their say directly with their elected councillors – not through some market research as if the plan was for a new Mars Bar wrapper instead of a multi-million pound privatisation. “At UNISON’s first public meeting at the end of June, people were hungry for information on the privatisation plans which betrayed just how much they were in the dark about the scale of the sell-off and the dark side of the tendering process. “We hear much about the ‘big society’. Well, I’ll tell you what the real ‘big society’ is. The ‘big society’ is communities across Edinburgh taking things into their own hands in the last few weeks and setting up public meetings to call councillors to account on privatisation. UNISON has been proud to support these meetings.